When buying a new Mac, Apple gives you just enough information about the system’s hardware to make a good comparative choice between the different models, but the company keeps the exact hardware details hidden in order to avoid customer confusion. For example, when shopping for a new MacBook Air, Apple tells you that the base CPU is a “2.5GHz quad-core Intel Core i7 processor (Turbo Boost up to 3.7GHz) with 6MB shared L3 cache”, but doesn’t reveal the specific model. You’ll immediately see a new line of text with the exact make and model of your Mac’s CPU. 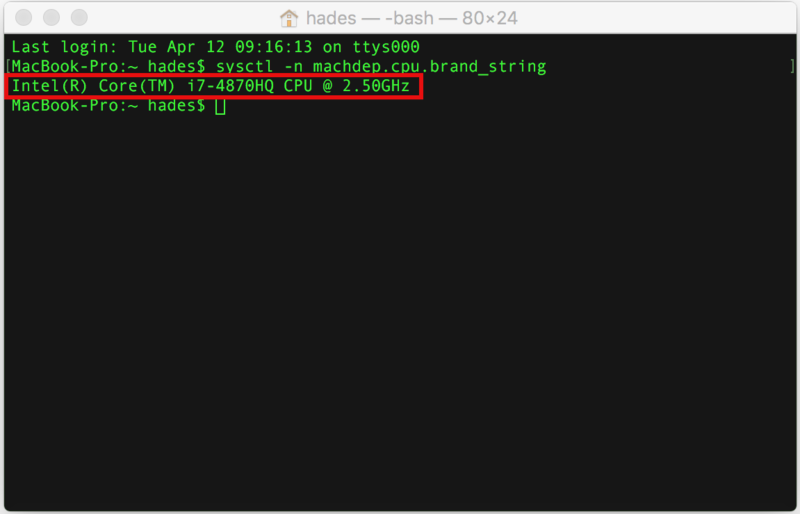 In our example, our 2015 MacBook Pro is powered by a single Intel(R) Core(TM) i7-4870HQ CPU @ 2.50GHz.